Turf managers in the southern United States have traditionally overseeded bermudagrass during the fall to maintain playable, aesthetically appealing turf surfaces throughout dormancy. This goal, however, is achieved with some difficulty. Maintenance throughout the winter and transitioning the playing surface from a cool-season grass back to a warm-season grass can be challenging. The good news is that overseeding is not the only way to maintain green turf during the winter. In recent years, turf colorants have served as the standard alternative to overseeding. As a result, several new products have been introduced to the market. The increase in colorant popularity, particularly at golf courses and sports turf facilities, can partly be attributed to the difficulty of transitioning during the spring from overseeded grasses to bermudagrass. Prolonged cool springs have also allowed overseeded grasses to persist through May and June, causing delays in bermudagrass green-up. 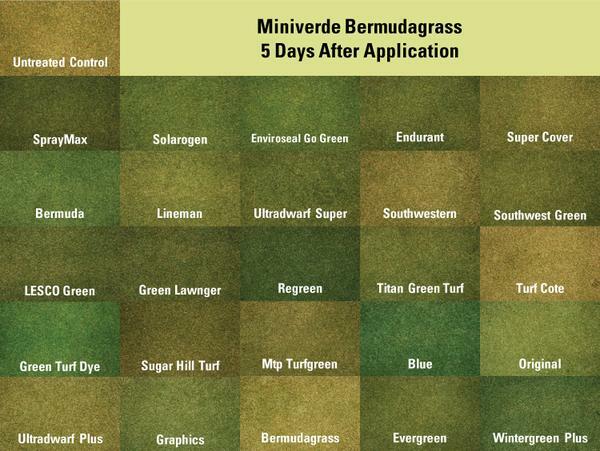 The use of turf colorants allows for a more predictable spring green-up and contributes to a healthier stand of bermudagrass going into the summer. To better understand how these new products perform and persist over time, we have conducted numerous studies at North Carolina State University. The knowledge related to the products and their application is limited. Our first detailed studies were applied to putting greens in 2008. Subsequent trials have included product evaluations on bermudagrass and zoysiagrass at an assortment of mowing heights. In total, we have evaluated over 30 products. These include products from manufacturers and distributers such as BASF, Burnett Athletics, D. Ervasti Sales, Enviroseal, Geoponics, Grigg, Harrell’s, J.C. Whitlam Manufacturing, SiteOne, Milliken, Missouri Turf Colorant, Pioneer Athletics, Poulenger USA, Precision Laboratories, Solarfast, US Specialty Coatings, and World Class Athletic Surfaces. In this publication, we provide an assessment of many of these products along with suggested application techniques. Although our research has focused on evaluating turf colorants during dormancy, colorants can be used in several other situations throughout the year. A turf colorant can be a useful tool to hide unsightly blemishes in both cool- and warm-season turfgrasses. These blemishes include turfgrass areas that may be suffering from issues such as disease pressure or nutritional deficiencies. Other possible uses of turf colorants include painting of divot sand for golf courses and masking of painted lines on athletic fields. Prior to selecting a product, a turfgrass manager must consider several questions. These questions may include whether the colorant will be applied to dormant or actively growing turf, minimum amount of time needed for acceptable color, and even how well this product matches existing turf color. During our research trials, it has been apparent that product formulation varies greatly among colorants. This variation suggests that some products may be more effective in some situations than others. Cost may also be an important consideration as applications can vary from $200 to $1,000 per acre, depending on product and application rate. All variables considered, it is important that a manager identify goals for a colorant application to most effectively select the colorant that will achieve desired expectations. Colorant is the current leading alternative to overseeding warm-season grasses. Cool, wet springs and drought-resistant cool-season grass varieties used for overseeding have made spring transition more difficult. Painting requires minimum turfgrass preparation and provides an attractive surface. Colorant is affordable compared to overseeding. Colorant can be used on cool-season grasses during drought or to reduce mottled appearances from winter or summer stress. Colorant can conceal turf blemishes. Colorant increases surface temperature, which may aid plant growth. Generally, colorant products fall into three categories: paints, “pigments,” or dyes. In simple terms, the difference among these categories involves the amount of binder in the product. Paints have binder amounts that usually comprise between 10 to 40 percent of the concentrated product, whereas the pigments have much lower amounts of binder. Paints contain mostly insoluble pigments designed for opacity compared to pigments and dyes that have soluble organic pigments that provide color with very little opacity. Between paints and dyes, there are several products along a continuum–with perhaps the greatest difference being pigment ingredient and the binder type and amount. These products between paints and dyes are often termed as “pigments” by the turfgrass industry. The term "pigments" thus refers to low-binder products that have the opacity characteristics of paints. The products with a higher percentage of binder (but less than that of paint) are often termed as “colorants” by the turfgrass industry. These two ingredients (pigment and binder) have a significant influence on application and durability. Due to varying levels of binder and pigment contents, products have a range of viscosity and application rates. As mentioned before, products labeled as “pigments” have a lower viscosity and do not express the same color longevity as a paint. For this reason, pigments work much better when applied to naturally “greener” turfgrass that has some photosynthetically active tissue to enhance color for short durations. In contrast, the products with higher binder content can be applied to dormant turfgrass and still have acceptable, lasting color. One way to distinguish the product type is by the application rate found on the product’s label. These labels suggest that most pigments be applied at rates between 8 and 64 ounces per acre. Labels on the colorants with greater amounts of binder usually suggest application rates between 3 and 10 gallons per acre. Examples of these products can be found in Table 1. Paint – contains four basic components: solvent, pigment, binder, additives. When applied to a substrate in a thin layer, paint is converted to an opaque solid. Solvent – consists of water in these types of products. Pigment – insoluble product that provides color. Multiple pigments may be combined to produce desired color (such as, yellow pigment added to blue pigment to form a green product). Binder – film-forming component of paint. Imparts adhesion, binds pigments together, and imparts other qualities. Binder is often a resin and classified by is its film-forming mechanism. Additives – may consist of surfactants, thickeners, emulsifiers, and other ingredients to enhance mixing, application, dispersion, or adhesion properties. Colorant – a general term related to products that impart change of color. A colorant can be called a dye, pigment product, paint, or other such term. Colorant is usually considered to be a product that is used to treat completely dormant turfgrass. Pigment – a dry insoluble substance that when mixed with water forms a suspension. In relation to products, "pigment" is a term used to describe a highly concentrated pigment product with no binder or at least minimal binder (compared to traditional paint products). Usually only lasts one to two weeks under normal weather conditions (and depending on amount and type of resin). Dye – a liquid that contains soluble ingredients such that it forms a solution. Normally used as a spray indicator. Table 1. Products that have been tested by NC State, their label dilution rate ranges, and approximate product application rate. Pigment products tend to be darker in color, which often is more towards a blue hue (especially when applied to dormant turf). Other colorant products vary in color and are more product-specific. Because application rates are much greater for higher percentage binder products, their coverage typically yields a color more indicative of their diluted liquid color. Some colorants contain pigments designed to darken them (such as black pigments), whereas some companies just try to provide a more natural-looking green color. Remember the saying, “Beauty is in the eye of the beholder.” That certainly can ring true when evaluating these products for green color (Figure 1). Color longevity has varied over the 10 years that we have tested these products. In some years, a specific product provided color that lasted the full winter, and some years it did not. When applied to completely dormant turf, a sequential application should be expected in around 30 to 45 days to maintain visual quality. After a second application, the interval for a third application should be longer. Generally, pigment color will last 7 to 14 days. In our research, we have not been able to predict color longevity from year to year. Sequential application windows will greatly depend on level of use and climatic conditions. A common complaint heard is that some of the colorant-treated turf exhibited a bluish tint over time (some quicker than others). While this tint may sound like a negative attribute, one survey revealed that many people did not mind the bluish color. Why blue? Green color is produced by mixing blue and yellow pigments. The yellow pigments are generally not as stable in ambient conditions as the blue pigments. So as the products age, the blue tends to be the more dominant color. In our research, we have found that most of the darker, bluish products maintain their color longer than products that started out as a more natural-looking green color. The more natural-looking green products tend to fade to a grayish color as they age. Reapplication can provide improvements for off-colored colorants. But once a product shifts in color, reapplication may not result in a natural-looking green color due to the unnatural base color. This is especially true for products that shift to a bluish color. Figure 1. Color tones five days after colorant application onto ‘Miniverde’ bermudagrass green. Figure 2. 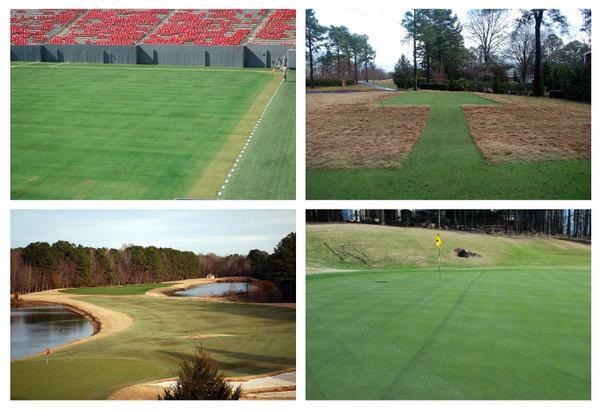 Examples of treated areas (clockwise from top left): athletic field, golf tee, golf green, golf fairway. The painting process can be boiled down to picking and purchasing a colorant, adding water plus colorant to your sprayer, and spraying the mixture onto the area where color is desired. If the color is not applied evenly or dark enough, additional passes (ideally perpendicular) can be made to satisfy aesthetic desires. There is some clean-up required after application, but no season-long care as with an overseeded turf. Remember to be very careful not to get these products on anything you do not want stained. Structures such as fences, tee markers, yardage markers, and benches will absorb the colorant and may be permanently stained. Cart paths and other impervious surfaces should also be of primary concern. These products are not labeled as a pesticide, but you should still use good judgment and wear personal protection equipment when using pressurized sprayers. Certain conditions at the time of application may have a dramatic influence on resulting colorant color and performance. The most common determinants include turf color, presence of moisture on the turfgrass surface, and air temperature. Turfgrass color at time of application greatly influences the appearance of a colorant application. A tan to brownish appearance of the turfgrass is usually related to the level of turfgrass dormancy, but it may be the result of recent stress (disease or drought) that has caused the turfgrass to be “off-color.” If the colorant is applied to semi-dormant turfgrass, the color will look better. For optimum results, do not wait until the turfgrass is straw-brown. The natural green color of actively growing turf will greatly enhance any colorant application. The presence of moisture can be beneficial, especially if the turfgrass is dormant or nearly dormant. As the turfgrass becomes more dormant, the leaf tissue becomes dryer, so adding supplemental water (irrigation) will increase leaf moisture. The added moisture will help protect the applied colorant from potential absorption into the leaf tissue, which can dramatically increase the colorant’s coverage and improve color. Furthermore, products that are higher in viscosity benefit more from leaf wetness compared to products of lower viscosity. While this wetness is usually accomplished with a quick syringe cycle from the irrigation, some people have waited to apply the colorant after a light rainfall or even early in the morning with the presence of dew. Be aware that too much irrigation that causes puddling can also dilute the application and result in an undesirable appearance. Most golf course superintendents are proponents of applying colorant onto frost-covered leaves. Although this practice can result in better coverage and a darker appearance, the practice has the potential of producing tire-marks from driving on frosted leaves. And many of the colorants do not dry or adhere very well when applied at low temperatures. The air temperature at the time of application has been found to be important for performance. Our research has shown that air temperature during colorant application can greatly influence the product's ability to adhere to the turf foliage. Specifically, when applied at temperatures below freezing, colorant transfer from leaf tissue onto absorbent material more than doubled compared to when colorant was applied at 45°F. If transfer is a concern, a turf manager may not want to apply these products when frost is present or air temperature is less than 45°F. Severe staining of athletic uniforms can have significant cost ramifications. Conversely, this is less of a concern on golf courses as participants are not likely to have direct contact with colorant-treated turf. Pick the product to use. Calculate the quantity needed based on dilution rate and area of application. Set up and calibrate the sprayer. Re-application later in the season may be necessary. A general recommendation for application volume for high binder products is to apply the product and water mixture between 40 and 250 gallons per acre (GPA). Our research suggests that good results for the products could be achieved with application rates between 80 to 120 GPA using flat fan nozzles from a multi-nozzle boom sprayer. To get the higher volumes, it is helpful to use split applications in two directions to get the total rate. Some turf managers use air-induction nozzles, and some have had great success using dual-fan nozzles. Ultimately, each applicator may need to test their sprayer to find out what works best in their situation. To achieve higher volumes (greater than 150 GPA) with single applications, turf managers are typically using single wand applications. While a hand wand may be a slow way to apply these products over an area, well-practiced painters can have excellent results on areas the size of golf greens or tees. A walking boom (often called a "Spray Hawk") may be somewhere in the middle in terms of convenience and application rate of a single wand and a traditional sprayer. Another item to keep in mind is that to have well-defined edges, a hand wand must be used unless edging material is placed over the turfgrass along borders to prevent any overspray when using a boom sprayer. There are a few potential drawbacks when using a colorant. It does not provide a wearable surface like an overseeded grass. Once the dormant tissue is worn or torn away, no regeneration occurs until spring. This results in a dormant canopy that is primarily comprised of vertical stems with little leaf tissue. A dormant canopy absent of leaf tissue provides a limited canvas for sequential colorant applications that may lead to a less than desirable appearance. So the “wear factor” must be considered if the turf will have heavy winter traffic. There is also the risk of an uneven appearance due to application error or a blemished turfgrass stand, which is another reason why it is imperative to go into winter with a healthy stand of turf. Also, divot sand in fairways or on tees may stand out more after treatment, although most of these products can also be used to color sand. For any new practice to be accepted, it must make sense financially. Depending on the brand, a gallon of turf colorant will run from $30 to $75, with most distributors giving volume discounts. This is particularly important for turf managers needing to treat larger areas such as golf course fairways or several athletic fields. Almost all the products are sold as a concentrate that must be further diluted prior to application. The cost of colorant needed per acre using the higher recommended application rates range from $200 to $1,000 an application, depending on colorant brand. With fluctuating seed prices, using one of these products can offer considerable cost savings. Considering that overseeding will require such tasks as ground preparation, seeding, watering, fertilizing, mowing, pest control, and spring transitioning, colorants may be a significant labor-saving alternative as well. Although potential monetary savings are a major advantage, the ability to better manage the warm-season grass is what keeps turf managers interested in this practice. A common question is, “What is the best colorant?” In fairness, no one turf colorant was clearly superior in terms of natural-looking green color at the time of application and at the end of the winter season during our product evaluations (Table 2). In one set of product evaluation trials, statistical analysis was used to group colorants based on similarity of attributes, which included colorant intensity, color, and hue over two years (Figure 3). Results indicated that the colorants with the best natural-looking green color (Group 2) generally did not last as long as some of the others. This group included Green Lawnger, Lesco Green, Ultradwarf Super, Southwest Green, and Endurant. To have a natural-looking green color for the duration of the dormant period, our data suggest reapplication will generally be necessary. A longer-lasting color (Group 1), although it may have a bluish or lime-green hue, can be achieved with minimum to no reapplication. As we later report in discussing the pigment products, these bluish or lime-green products may have application in situations when the turf's natural green color is being accentuated rather than when trying to cover tan to brown dormant turfgrasses. This group included Kameelyan-Bermuda, Kameelyan-Blue, Green Dye Turf Colorant, Go Green, Regreen, and Wintergreen Plus. The products not mentioned as part of these two groups (Group 3) were generally statistically lower in the combination of measured attributes. Table 2. 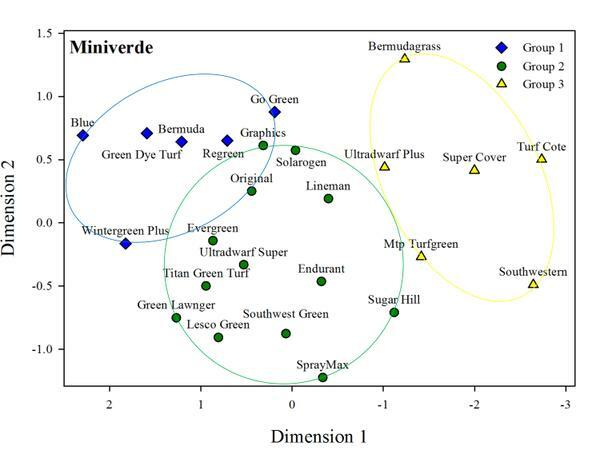 Visual colorant quality ratings following the application of turf colorant on bermudagrass. Color ratings are based on the color of the colorant on a scale of 1 to 9, with 1 representing straw brown and 9 representing dark green. Products categorized as Blue, Green-Blue, and Yellow Green had a maximum rating of 7. Figure 3. Colorant groupings based on colorant intensity, color, and hue over two years of evaluation. There have been new products introduced or removed from the market since our most recent product evaluation trial. And some of the products listed above might have been altered in formulation since our evaluation due to the acquisition of certain products by new manufacturers. For example, Geoponics has since expanded their product line to include a total of five turf colorants. GRIGG, who has primarily marketed pigment products, have recently introduced a paint (GRIGG Spaint) in their product line, which is targeted for athletic field applications. Lesco Green was sold by the retailer John Deere Landscaping at the initiation of our study. The retailer is now known as SiteOne. So, unlike pesticides, which are closely regulated, the colorant market is much more volatile in terms of ownership, formulation, and product availability. Products have been tested for how well they adhere to the turfgrass surface following application. Colorant transfer is an important consideration for materials that will come in direct contact with a treated turf. During evaluations, we found that product selection and application timing can greatly influence colorant transfer. All of the products listed in Table 1 were screened for colorant transfer one day after they were applied. We identified seven products that had higher levels of colorant transfer and conducted a separate trial that monitored colorant transfer over the course of seven weeks. The products included in this trial were Titan Green Turf, Regreen, Endurant, Green Dye Turf, Blue, SprayMax, and Solarogen. Ultradwarf Super was also included to serve as the standard for colorant transfer as it yielded the lowest amount of transfer of all products screened. All products reached acceptable levels of colorant transfer two weeks after application with the exception of Blue and Regreen. Although not ideal, colorants that “rub off” at higher rates may still be used if applied far enough in advance of turf use. In our most recent trial, we have identified that air temperature during colorant application can greatly influence colorant transfer. 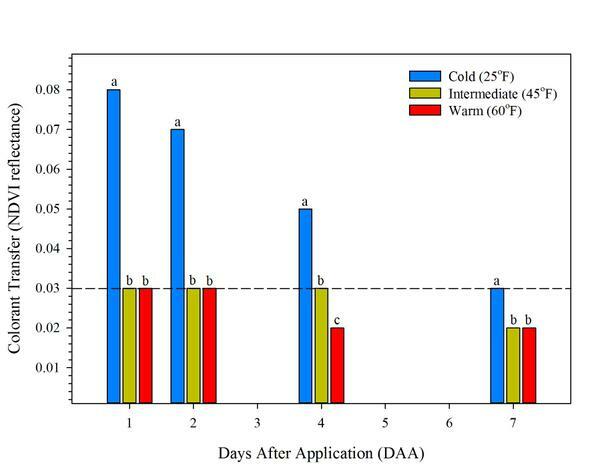 Seven turf colorants were applied at 25°F, 45°F, and 60°F and sampled four times over the course of a week to quantify colorant transfer (Figure 4). When applied at 25°F, we found that colorant transfer was dramatically increased. We also found that three of the seven products tested performed much better than others. These products included Spaint (GRIGG), Green Turf Paint (Harrells), and Green Dye Turf (World Class). Although Green Turf Paint and Green Dye Turf were both rated as two of the worst performing products in our initial trial, they were among the best in our most recent trial. This is most likely due to using lower labeled rates and possibly due to changes in product formulation. According to our most recent data, Spaint, Green Dye Turf, and Green Turf Paint could all be preferred options for turf managers who are concerned with colorant transfer potential. With proper application timing and product selection, turf managers can reduce the potential for transfer of turf colorants onto absorbent materials. Figure 4. Mean transfer (expressed as a normalized difference vegetation index, NDVI, value) of the seven products evaluated as a function of air temperature. In some instances, there are advantages to using short-term pigments (Table 3) over colorant products with greater binder or vice versa. For example, in areas with extended dormancy, short-term pigment products generally do not provide a green color that looks very natural on dormant turfgrass, nor does the color last very long. Most short-term pigment products are excellent at accentuating the turf's natural green color, and can be very useful in early-to-mid fall prior to dormancy or in late spring before the turfgrass has fully greened. These short-term products are also significantly cheaper compared to higher-binder colorant products. In the desert Southwest or southern Florida, temperatures will intermittently be high enough that bermudagrass growth may occur through the winter. If turf growth occurs, mowing may remove the colorant. In these cases, short-term products may be most effective because they enhance green color at a lower cost per application. In other instances, a hybrid application of both types of products has been advantageous. When bermudagrass just begins to turn off-color, an application of a pigment is an inexpensive way to improve color, and the product can also serve as a heat sink to promote sustained growth. Some turf managers have labeled this as “tinting” the turfgrass. With periods of fluctuating temperatures (but before a hard frost), subsequent applications may be necessary. Once a hard frost occurs, the quality of color from a pigment will not match the lasting color from a colorant. A turf manager may decide to use this technique in reverse in the spring if the turf begins to grow but does not have a rich green color from active growth. Table 3. Commonly used pigment products and their manufacturer (in parenthesis) for the turfgrass market. A common strategy in areas where dormancy is prolonged throughout the winter is using a combination of both pigment and colorant products. This has become popular among many turf managers because they are able to use the remaining natural green color of the turfgrass as it enters dormancy to accentuate the pigment application (Figure 5 and Figure 6). This practice often delays the need to apply the longer lasting, more expensive colorant products by a couple of weeks. However, as mentioned earlier, once the turfgrass goes completely dormant, we do not recommend any further pigment applications as such an application will result in an unnatural-looking blue color (Figure 7). To test this strategy, a hybrid application study was used to evaluate the use of pigments throughout the year (rather than colorants) as well as the hybrid pigment/colorant application scheme. During our evaluations, it was noted that golf greens that are covered during cold temperatures required substantially less product than a turfgrass that is not. We also found that with frequent pigment applications, rates should be reduced to avoid an unnaturally dark color. The colorant application (product with more binder) resulted in a very nice natural-looking color early in the study (covered greens), and the natural-looking color lasted throughout the winter without further product applications. Results when applied to tee boxes were much different compared to the covered green applications. Because tees are not covered on golf courses, they reached complete dormancy early on during evaluations. More frequent applications of pigment were needed to maintain color of the tee boxes. However, once the pigments begin to turn bluish in hue, it is very difficult to make subsequent applications and achieve a good natural-looking color (Figure 7). At that point, a product with greater opacity (and more binder) is needed to produce a realistic green color. Figure 5. Exclusion square showing untreated turfgrass surface compared to that treated with 24 ounces of pigment per acre applied to an "off-color" green. Figure 6: Pigment application (32 ounces per acre) to an “off-color” tee. Figure 7. The tee in the foreground had repeated applications of pigment product, whereas the tee in the background was treated with a colorant with greater opacity and binder once the turfgrass went dormant. Colorants and related products offer an alternative to overseeding that may be more cost-effective while still providing an aesthetically pleasing turfgrass surface during dormancy of warm-season turfgrasses. These products do not provide a wearable surface like a growing turfgrass. But under moderate wear, using such a product may result in healthier bermudagrass due to less competition during the spring and summer months. The products vary in color, longevity, and ease of application (among other attributes), so turfgrass managers have options that they may consider. Turf managers can pick from several spray-on products to keep their turfgrass green regardless of the turf's condition. These products can accentuate light-green grass, mask blemishes, or cover the tan color of dormant turfgrass. They can be used on warm-season or cool-season turfgrass and may be applied on lawns, sports fields, or golf courses. There are several products currently on the market, so picking the best one for a situation may require some experimenting. Because there are two significant product categories, one may want to begin their decision process by deciding how they will use the product based on selected use characteristics (Table 4). Table 4. Summary of product category and selected use characteristics. † List of paint products can be found in Table 1. ‡ List of pigment products can be found in Table 3.